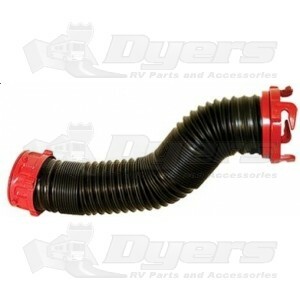 Extends The Dominator sewer hose kit an additional 5' for superior drainage over longer distance. Permanently attached fittings protect from leaks. No hose/fitting leaks – factory installed fittings ensure a leak-proof system. Secure connections – patented rotating fittings prevent hose from twisting and pulling away from valve and sewer connection. New poly hose fully assembled and ready to use! Superior Drainage – holds its shape after installation. Protection from leaks – tough and rugged poly construction. Durable – UV stabilized for protection from the sun.